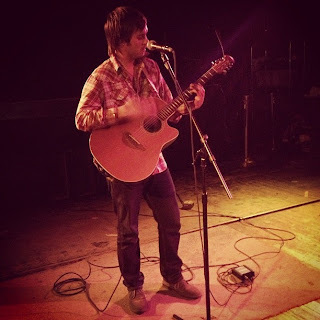 Robbie Vozza is a singer/songwriter with a long history of making music in different bands. Currently operating out of the Danbury area, he has begun working hard with a strong focus on his own solo music. I got a chance to ask Robbie a few questions, take a look at his answers below! Roger: Hey Robbie, where are you from? Roger: How long have you been writing songs? Where do you generally play out? Robbie Vozza: I started playing guitar at around 15 yrs old, and song writing followed pretty shortly after that. I've always written my own music while simultaneously writing for my two most constant full bands. ( The Ghost Sonata, Sept. 2005-sept. 2009, and DawnMother, Oct, 2011-current). Its only been within the last year that I've really started to put a much more heavy focus on my own music. I think it just hadn't been the right time before now. Sometimes the universe has a way of forcing you into situations that your really not ready for but have always wanted to do. It seems that the Heirloom Arts Theatre in Danbury, CT always ends up being my home base. I've been playing, working, and going to shows there since I was 15 when it was still the Empress Ballroom. I love the Heirloom, and the all the people that help run it. Other than that I've been playing a decent amount of MA shows. Dave from Unbuckled Records has always treated me so well up in the North Hampton area. I'm just starting to play shows up in Lowell Mass. The last show I played up there was awesome! Id like to thank Jeffrey Sullivan for putting me on that show! Did a short tour late July into early August with a fantastic band called The Attending. That was Lowell, Boston, Providence, Danbury, and a western MA show. Roger: Tell us a bit about your two releases this summer, what is your approach to recording? What should someone expect when they put on your music? Robbie Vozza: My first release Swim Like A Sponge came out in May of this year. The interesting thing about that release was that I had had some of those songs for so long that by the time I went to do the release I wasn't even playing them anymore. A lot of those songs also did not come across right without a full band, which I did not have for my release show, so in actuality I only played about three songs off of that album for my CD release show. Doesn't really make sense but I really wanted to get something out there, and if I didn't do that release those songs probably would of never been heard. Swim Like A Sponge was mostly recorded at my house using a Tascam 2488 digital recording studio. Which is kinda old school, but its what I've always used when recording by myself. The 3 Songs on my bandcamp that are the summer 2013 were recorded with my buddy Mike Dicresenzo. The Ships Don't Sing ( Lets Taco Bout It) and Like a Bull in a Zoo were recorded live using a Zoom recorder. Now They Got was recorded using a couple different mics and Protools, with some over dubs. My next album which should be out this Fall I am planning on doing everything using a Zoom recorder. I really want to pick a different spot to record each song, hopefully pairing each song with video as well. When someone puts on my music they should expect music haha lol ; ) No I guess if I had to describe my style it would maybe be folkish? Indie-Folkish? Ya'll be the judge. Roger: Who are your favorite local musicians? What bands do you enjoy and play with? Robbie Vozza: Hmm that's hard to say. When my old band was in full swing I would have said What's Left Of The Trees, Fugue, and Black Churches, but Fugue has since broken up, and Black Churches shows are few and far between. Lately I've really enjoyed playing with Fishing The Sky, Brian Stankus, The Guru, and Chelce Hessler. Roger: So what's coming up for you? Any planned releases or shows? You can catch Robbie Vozza @ Two Boots Bridgeport on October 3rd with Tracy Walton, Brian Larney and (one of our faves) Buck McGrane! \m/ EASTWOOD 4 LYFE! HAIL LORD ROBBIE!